In July, Elizabeth Mitchell will be releasing a new album from the Smithsonian Folkways label. The album, “Little Seed,” is the only album containing Woody Guthrie’s children’s songs just in time to for his centennial celebration. Mitchell is featured on the album along with her husband Daniel Littleton, daughter Storey and friends, including Amy Helm, daughter of the late Levon Helm, Jay Ungar and Molly Mason, and Ruthy Ungar. “Little Seed” will contain 13 songs (totaling 29 minutes), 8 of which are new recordings while 5 are previously released recordings by Mitchell. Below is a track listing plus 2 sample sneak peaks which existing fans and newbies are sure to enjoy. We are eagerly awaiting this release! 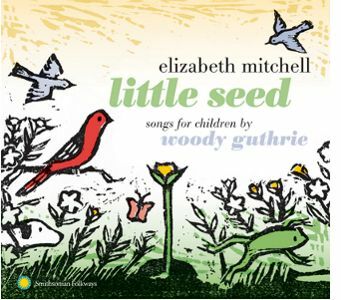 Anytime we get to hear Elizabeth Mitchell (and family), it is always such a delight and the pairing of her with Woody Guthrie’s work just seems so right. Enjoy a sneak preview of Bling Blang and This Land is Your Land. 6. Who’s My Pretty Baby?